Greek immigrants began arriving in Wisconsin in the early part of the 20th century, seeking economic opportunity in America and to escape oppression and war in Greece. They brought their rich cultural heritage with them. Having no place of worship in Madison, they drove to Milwaukee, Rockford and Fond du Lac to carry on the Greek Orthodox faith. After the war ended the army base that provided servicemen with Orthodox Church services was Old Methodist Church dismantled. This propelled a group of Orthodox people to investigate and realize their dream of having their own Church community in Madison. In 1951 Assumption Greek Orthodox Church (AGOC) was organized and incorporated. The first services were held at Grace Episcopal Church on the square. Soon followed the purchase of the Bashford Methodist Church building that houses the present day AGOC on East Washington Avenue and North 7th Street. Critical to the future of the Church, renovation efforts were lead by Alex Frunza, a member and prominent architect from Romania. He brought forth a plan to remodel the existing Church structure to improve the building, and to transform it into a traditional Orthodox Church. Because of his tireless efforts and his own monetary contributions, the Sunday School gained new space, the dome, apse, nave and iconostasis (icon screen) were remodeled and a Bishop’s throne was constructed. His efforts insured that AGOC would have a home and presence for a long time in Madison. By 1963 the singing Choir was established and necessary altar implements were purchased, leading the way for the future of the Church. The young AGOC gained solid footing in the Madison community and an annual community picnic was begun (the origin of today’s Greek Fest); UW-Madison History Professor, Michael Petrovich, a Serbian and a talented musician, liturgical music composer, was recruited to lead the choir, leaving a lasting legacy; the Hellenic Women’s Society became a chapter of The Philoptochos Society (“friends of the poor”), a parish house was purchased; and the Orthodox Students Society for the students at the University of Wisconsin was organized. A variety of parish priests added to Assumption’s history including Father Anthony Gergiannakis and after five productive years, he left to continue his illustrious career. He later became Bishop Anthony, and eventually Metropolitan Anthony. In addition, Father John Mangos, MD, Reverend Father George Dounelis, Father Andrew Koufopoulos, Reverend Father Joseph Tzougros, Fr. Joseph Tzougros Economos, and currently Father R. Michael Vanderhoef, have led the congregation. Most notably Father Joseph was the community’s longest residing priest for 25 years, raising his family there and encouraging the progression of property expansion. His son, George Tzougros, with devotion, directs the choir of notoriety of this region. It carries on the traditional liturgical music written by Professor Michael Petrovich. When the renovation of the Church began, David Giffey, our resident iconographer assisted in selecting the icons for the new interior. 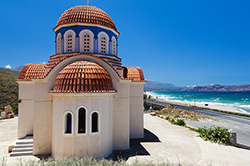 His involvement in this project ignited his love and interest of iconography, traveling to the monastaries of Greece to learn the techniques involved in this holy artistic tradition of the Orthodox faith. In 2016 the AGOC community decided to renovate the Church building. Having purchased adjacent land that previously owned by a business, the structure was expanded to accommodate three Sunday school classrooms, a large inviting foyer with a staircase leading into the sanctuary, and an expansion of the social hall in the sub-level. This restructure also enabled a secondary parking lot and drop off area in the front of the building. The alterations do great justice in highlighting the prominence of the building and its Orthodox dome. Today our Church community flourishes. 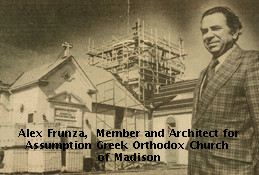 We remember the founders and the many individuals and Assumption Greek Orthodox Church of Madison families that helped to build and let thrive, Assumption Greek Orthodox Church of Madison. We are a worshiping multi-cultural community some of which include, Greeks, Serbians, Russians, Ukranians, Croatians, Arabs, Armenians, and Ethiopians. We welcome you to come visit us in worship and in fellowship.